The potential arrival of European Golden Plovers is a much anticipated thing for Newfoundland birders, who keep an eye on the trans-Atlantic weather and and scour fields and barrens along the northeast coast. Origins: Breeds across northern Europe and Asia, as well as Iceland. It is highly migratory and most records are likely of birds migrating from northwestern Europe to breeding grounds in Iceland. Details: Records occur almost annually, typically in April/May and sometimes in numbers. Exceptional records are from summer (St. Paul’s Inlet, July 1990) and fall (St. Shott’s, November 6, 2005). 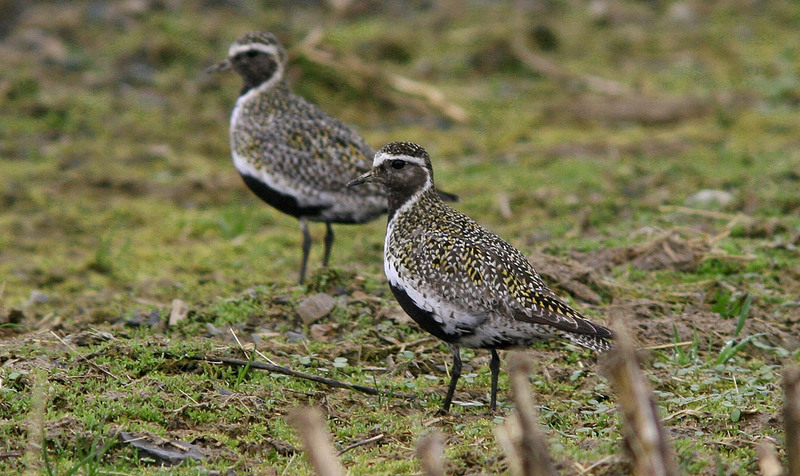 Do you know of the record date time spans (such as 25 Apr – 4 May for example) of any previous records in Newfoundland from the past of European Golden-Plover? Trying to determine how “chaseable” this bird may be prior to going all the way from California when it takes 2 full days to get to St. Johns. Would be most helpful prior to spending a large amount of money on an airline ticket knowing approximately how long any occurrences stayed in the past to them continuing on in their journey. Thanks a HUGE plus in advance. Saw five at Fishing Point St. Anthony NL today 02 May 2014. It is the first time I have seen this bird and the locals I spoke to (I’m visiting from Corner Brook) had not seen them before. They were feeding mostly on the grassy areas surrounding the lighthouse.